A coloured 18th century print based on a contemporary painting of how the burning City of London looked during the Great Fire of 1666. This is a companion to another print in the King's Topographical Collection. The note explains "The Scene is the original Ludgate taken at the instant of time when the walls of the gaol adjoining it fell and exhibited to the view Old St Paul's Church just taking fire and Old Bow Church in the background". Old St Paul's Cathedral, one of the most symbolic buildings claimed by the fire. 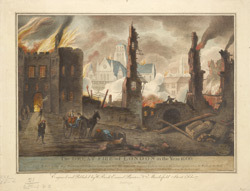 Although the fire was disastrous for London in destroying thousands of homes, many public and government buildings and 87 churches, it allowed a chance to build a cleaner, better planned city. As Daniel Defoe commented "It is true that before the Fire of London, the streets were narrow, and public edifices, as well as private were more crowded, and built closer to one another; for soon after the Fire, the king, by his proclaimation, forbid all persons whatsoever, to go about to re-build for a certain time, viz. till the Parliament might regulate and direct the manner of building".